"I know that for some musicians, writing songs is like therapy and the way they get their emotions out," says Los Angeles-based singer, songwriter, and multi-instrumentalist Robert Francis. "But for me it's more than an outlet -- it's a way to keep me from completely losing my mind." Such an intense statement may sound like the drama of being 21, which Francis is, but listen to the two albums that he's created, 2007's indie release One By One and his upcoming major-label debut Before Nightfall, and it becomes clear that it's true. As NPR has noted about Francis' modern take on timeless American rock: "He has laid himself out in song and created some incredibly moving and beautiful musical moments." "Honesty is what makes a good song," Francis says. "I don't think there's a reason to write unless you're writing about something that's deeply important to you. If I write anything, it has to be 100 percent heartfelt. There's not a shred of anything within my songs that isn't 100 percent genuine." Francis' work pulses with an undercurrent of forceful candor that cannot be faked. The songs on Before Nightfall are so personal that Francis has trouble explaining the specifics of what they're about, but he does offer that One By One came out of the emotional turmoil he suffered after a failed relationship, whereas Before Nightfall looks back on that relationship through the healing prism of time and finds hope in starting over and moving on to something new. "Songs like 'Darkness,' 'Climb a Mountain,' 'Junebug,' and 'Keep On Running,' are about knowing that the person you love is out there on their own and you can't do anything about it," Francis says. "They're about how impossible love becomes more impossible. But I think there's optimism in the songs; I don't think of them as sad. I think they're kind of uplifting." Francis' frankness goes down easier than you'd think thanks to his husky baritone voice, finger-picked acoustic melodies, and uncluttered arrangements. Burnished by his keyboard work (Francis plays piano, Mellotron, Hammond B3, Wurlitzer, Farfisa organ, and Solina synth), bandmate Graham Lathrop's elegant pedal steel guitar, and backing vocals from Francis' sisters Juliette and Carla Commagere, the songs on Before Nightfall glow with an earthy, homespun quality that draws on everything from country, to folk, to blues, to roots rock. Highlights include the aforementioned "Climb a Mountain," which features slide guitar from one of Francis' early mentors, Ry Cooder (his sister Juliette's father-in-law), the heartfelt country-tinged "Playground," and closing acoustic ballad "Do What I Can," where the emotion is so palpable, you can hear Francis' voice quaver as he slides into his upper-register. The intimate sound is deliberate, Francis says. "On the records I love, the vocals are right there. It sounds like you're in the room with the person and all the other instruments support the story. The greatest records were made like that. In no way was I trying to make a '60s or '70s throwback record, but the songs called for that intimate vibe. I wanted to get the band in a room, do it live, and make it sound as immediate as possible." To help him achieve that immediacy, Francis enlisted Grammy Award-winning producer D. Sardy (Oasis, Red Hot Chili Peppers, Marilyn Manson, among many others), whom he credits with "helping me come into my own with my voice. Sardy helped me sing out and make the vocals as raw and intense as possible. He was not the guy who was going to spend three hours on some crazy synth sound. He was the guy who said, 'Let's do this -- but just you guys. Let's make an old-school rock record.'" Sardy and the band (bassist Alex Kweskin, drummer Richard Gowen, and guitarist Graham Lathrop) kept the proceedings relaxed by making the studio feel like home. "I basically brought my living room to Sunset Sound," Francis says. "We brought all the rugs and some posters and lamps and recreated this little world that felt just like where we rehearse. We set up in a circle, stocked up on what we needed, and went to town." It was the way Francis imagines his favorite artists, like The Band, Gene Clark, Bob Dylan, and Greenwich Village folkies Karen Dalton and Dino Valenti made records. "There was a time when a few amazing artists moved up to Bearsville to get away from the city and really just make beautiful music," he says. "They weren't concerned about what was going on outside their bubble. They created their own universe. And that's what I wanted to do ? to forget about everything and just concentrate on four guys in a room making music the way we wanted to make it." Born in Los Angeles in 1987, Robert Francis grew up surrounded by music. His father is a classical music producer and eccentric owner of one of the largest collections of sheet music in the U.S. One of Francis' earliest memories is his father "blasting music at full volume in his cluttered office under fluorescent lights until 4 a.m. while I was trying to sleep in the room next door." His mother, one of nine sisters, grew up in Mexico in a town so small that "it's just dirt, clay huts, boarded-up buildings, and a town drunk who walks around in the beating sun with a jug of Bacardi," Francis says. After Robert studied piano for several years, his mother encouraged her then seven-year-old son to learn guitar so he could play the traditional ranchera songs she grew up singing with her sisters. When Francis was nine, family friend Ry Cooder gifted him his first National Slide guitar. He also fell in love with Wim Wenders' 1984 film Paris, Texas, for which Cooder composed the soundtrack. "It inspired me," Robert remembers. "I got the idea in my head that I wanted to drop out of school and travel when I was 10 years old." By the time he reached eleventh grade, he decided school was not for him and left. He spent a little over a year living dangerously and upsetting all those close to him until he met a girl who would then change his life. "It was a really tumultuous romantic relationship that lasted on and off for a few years," he says. "Then it just sort of fizzled out. I started writing songs the first time I figured out how to pinpoint that feeling of loss. I guess I was just waiting to make music until I had something to say. From then on, I realized I could write songs that really meant something to me." 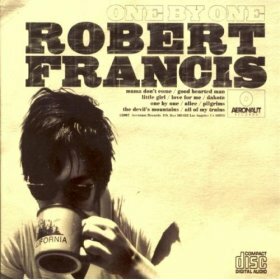 The result was One By One, which Francis recorded at a friend's recording studio and released in August 2007 on Aeronaut Records. It didn't sell much, but it earned positive reviews from critics who compared Francis to a young Townes Van Zandt. The attention led to a record deal with Atlantic Records, which is releasing Before Nightfall. Written over the summer of 2008 and recorded in March 2009, Before Nightfall is a snapshot of where Francis is now. "When people listen to the album, I want them to feel happy," he says. "I feel uplifted when I hear these songs; they don't bring me down. I hope people will be able to relate to them and feel as though whatever is going on in their lives is going to be okay."